As reported earlier, the Survivor’s Remorse TV show has been cancelled after four seasons on Starz. 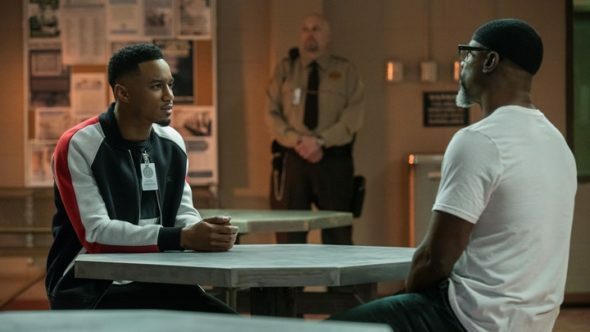 Although the initial cancellation news said the season four finale would serve as the Survivor’s Remorse TV series finale, and would air on October 15th, two episodes of the fourth and final season have yet to air. Starz has confirmed to us that it will run a double episode as the Survivor’s Remorse TV series finale this coming Sunday. The last two episodes of the comedy series are 4.09, “Family Ties,” and 4.10, “Answers and Questions.” Survivor’s Remorse stars Jessie T. Usher, RonReaco Lee, Erica Ash, Teyonah Parris, Tichina Arnold, and Mike Epps. The Starz TV series centers on Cam Calloway (Usher), a young basketball star whose lucrative contract with a pro basketball team catapults into the limelight. Check out the Survivor’s Remorse TV series finale episode descriptions in the cancellation article, here. What do you think? Are you still watching the Survivor’s Remorse TV series? Is this Starz TV show ending at the right time? Should it have been cancelled or renewed for season five? More about: Starz TV shows: canceled or renewed?, Survivor's Remorse, Survivor's Remorse: canceled or renewed? THIS SHOW WAS AWESOME AND SHOULD NOT HAVE BEEN CANCELLED! First Being Mary Jane now this! Who do t want to see us winning….them or us????? I really like Survivor’s Remorse. The casting is great & the story lines are very interesting. They left us withba cliff hanger. There was so much more to live out. Starz really should reconsider. I knew it was too good to be true, a series with witty, intelligent dialog, meaningful, thoughtful and insightful scripts. I started watching the show this season and I thought the show was really interesting. I wanted to see how the characters developed in dealing with their problems. I truly hope Starz will reconsider their decision to cancel the show at this time. I like this show. I don’t follow many series but I love the characters and their quick wit. We need good positive Black shows with good script and good actors. I will miss it.